The first time I ever saw the Pinterest website, I thought it looked like thousands of magazines, catalogs, and blogs had gotten together and thrown up on it. From the “easy” DIYs, showplace Anthropologie living rooms, and stylish supermodels posing in exotic locales – I immediately felt that whole vinyl record scratch sound effect in my mind. Who’s got time for this sh*t?????? Seriously, do real people actually plan a children’s birthday party with a $700 “candy bar,” 18-layer cake, new dress sewn by mom, handmade bunting, decorations, and party favors, and themed refreshments? It sure isn’t something I have done, and right now I am thanking my lucky stars that I have chosen to forego motherhood altogether. In 2013, the TODAY show coined a phrased called ‘Pinterest stress’: the worry that they’re not crafty or creative enough. Symptoms include staying up until 3 a.m. clicking through photos of exquisite hand-made birthday party favors even though you’ll end up buying yours at the dollar store, or sobbing quietly into a burnt mess of expensive ingredients that were supposed to be adorable bunny cookies for the school bake sale. While I do not have children, I have witnessed women who put a tremendous amount of anxiety on themselves, for really no reason. It’s so sad, because a website shouldn’t be able to affect them so negatively. 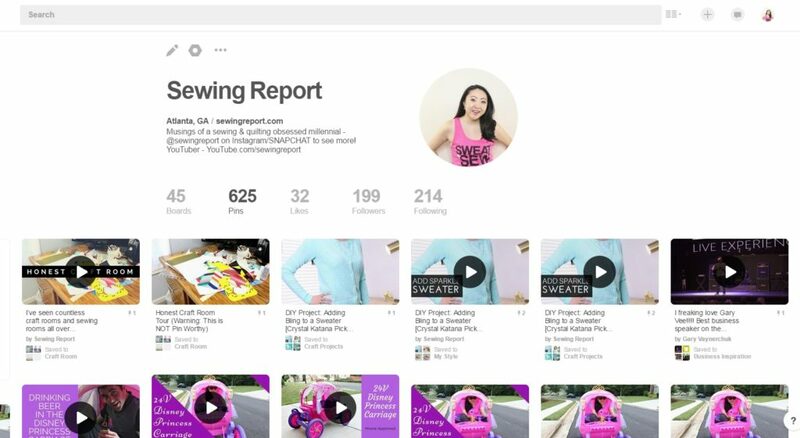 Recently, I was given some advice about Sewing Report – that I should go all in with Pinterest to widen my audience and gain more of a following. If this was more of a traditional DIY, sewing, or home blog – that would work very well. After all, LOTS of bloggers are already deploying this successfully. The people dishing out this advice had good intentions, but they aren’t super familiar with my content and don’t realize that I’m trying to CHANGE the status quo rather than conform. If I was creating the type of content or sewing projects that naturally fit in with being ‘Pin Worthy,’ than of course I would use Pinterest to my advantage and occasionally do. [Pokemon Purse] But I refuse to cram myself into the Pinterest mold, spending hours a day prepping and having impromptu photo shoots. No thanks. As a rather casual user, I also get easily irritated by a few things on Pinterest. Girlfriends have also vented these same frustrations. Dead links – You click on what you think will be a tutorial, but it goes to a defunct website. Why don’t you check that the link works before pinning it? Do the rest of us a favor! Sewing/Craft/Cooking/DIY tutorials with unrealistic photography – This one is super annoying, because it’s so discouraging for the people trying to attempt these projects only to have their end result look NOTHING like the example. Are these *really* your photos? Only beautiful people in ridiculous locations – Can we at least start Pinning images of more normal looking individuals with no makeup on, doing loads of laundry or sitting in a chaotic craft room? That would make me feel slightly better about my existence. Thanks! SUPER EXPENSIVE stuff – Be honest, are you really going to get that Louis Vuitton handbag, $2.5M home, $900 shoes, or $90 bronzer? By constantly coveting items you can’t afford – or would be stupid to buy anyways – you’re creating an environment of discontent for yourself. It’s so much more gratifying to be thankful for the things you DO have, instead of what you can’t attain. There’s a fine line between aspiration and delusion. Every once in a while, I’ll use Pinterest to look up specific information (ie: backpack sewing patterns). So it can occasionally be useful to me, but for the most part – it’s not a social media platform that I feel a deep devotion to. Do you love Pinterest? Do you feel like it sets the bar way too high for the way you live life? Let me know what you think below in the comments! I tend to use Pinterest like a visual bookmark. Before it existed my bookmark list would be huge, but after awhile If found I could not remember what I had book marked and found it difficult to tell just rom the description. Sometimes I don’t mind if a link is dead, as often I just want the picture for inspiration. If I am pinning as I want the process, then I always check the link is live. Completely agree on the blackhole ones. I hate clicking onto a page of links!! Reminds me of the early days of the internet where everyone had homepages that were just links to other pages of links. I want the pin to take me to one thing and preferably the thing that is in the description. Not really a Pinterest problem, but I find so many pages are full of pop-ups and advertising. Sometime horribly spammy stuff, like “you have won an iPhone” that you cannot click away from. It is not so bad on a PC, but if I get one of those on my phone, I often have to shut my phone down to get rid of it. Really bad form and I now won’t click on certain blogs now because of it. I am temped to contact some sewing bloggers to tell them, but not sure how they will take it. I use Pinterest as a kind of notebook so I can find for me interesting stuff quick and easy. Just like Pinterest more networks are changing and more advertising is coming towards you.